Divers must provide their own gear, rental gear is also available. Certification Card and DiplomaTo register contact Adventure Divers or drop in and see us. Once you have registered you can pick up your textbook or Online Code to start preparing for your course. All students must complete the medical questionnaire. Please note: only if you answer YES to any of the medical questions do you require a signed Physician's form prior to taking the course. Medical Form. Having completed your Open Water Diver training you are now on your way to becoming an Advanced Diver. 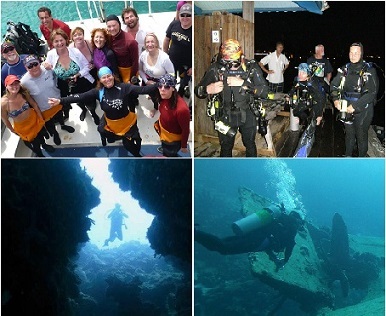 The Advanced Diver Development Program is designed to train divers in 4 different specialties. It is mandatory for divers to complete their Deep and Navigation specialties. They can then choose 2 other specialties from the list below. When you have successfully completed your 4 specialty courses and you have logged 25 dives (these can included any and all training dives) you will receive your Advanced Diver Certification card. As an Advanced Diver you become more independant and confident to dive without the help of a dive leader and to really enjoy the magic and wonder our oceans, lakes and rivers have to offer. By earning your Advanced Scuba Diver certification you will increase your abilities and comfort in the water and be ready for the next step, Rescue Diver. Classroom and confined water training conducted at Adventure Divers where we have our own private indoor heated pool and onsite classroom. We are located in the west end of Peterborough on Hwy 7 (4 km south of Fowlers Corners between Lily Lake Road and Parkhill Road West, 9 km north of Hwy 115). Each specialty course is unique, but the general course format is similar. Divers will need to read the textbook or online study, complete the knowledge review with their instructor, write the final exam if required, and complete 2-4 dives in that speciality.